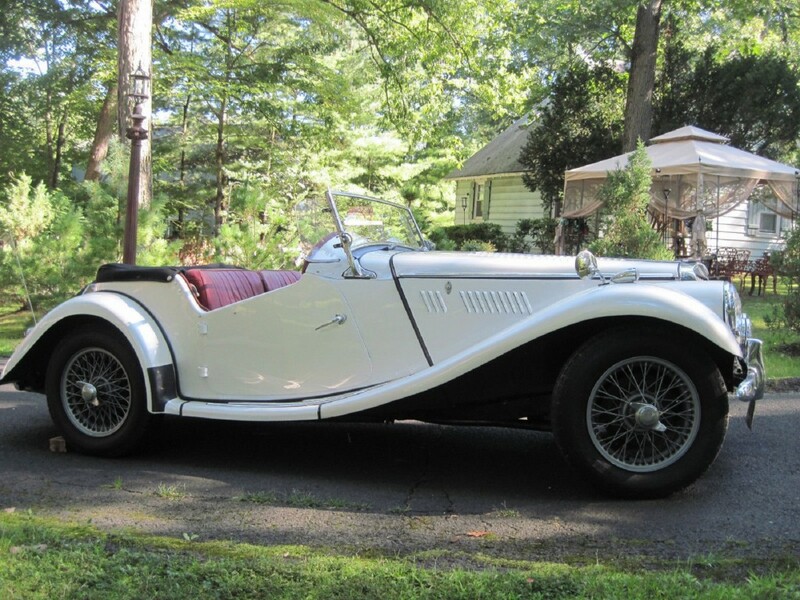 With styling reminiscent of pre-World War II automobiles, the MG T series cars proved to be popular, even after the war. First came the spindly TC followed by the sturdier TD. Before the streamlined MGA arrived in 1955, the TF was introduced with headlights faired into the front fenders and the top of the grille slanted toward the rear of the car. 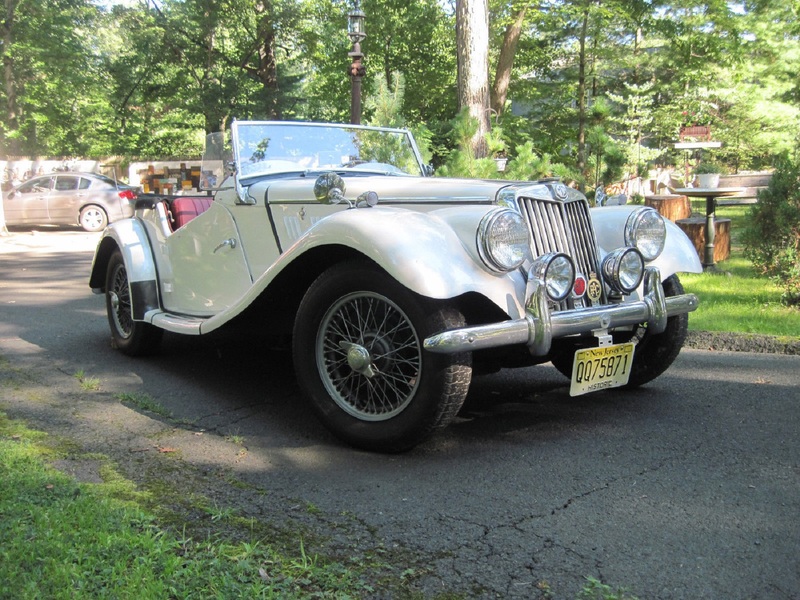 The style of the T series MG captivated Barry Ruck in his youth. “In the 1960s I bought, restored and sold T series MGs as a hobby,” Ruck recalls. However, life often gets in the way of plans and Ruck put his desire for an MG TF on hold, until about two years ago when he was nearing retirement. Ruck had been scouring automotive listings and found that of the few available TF models were either outrageously overpriced restored cars or were located on the west coast, far from his Columbus, N.J. home. In October 2013, Ruck’s luck changed. 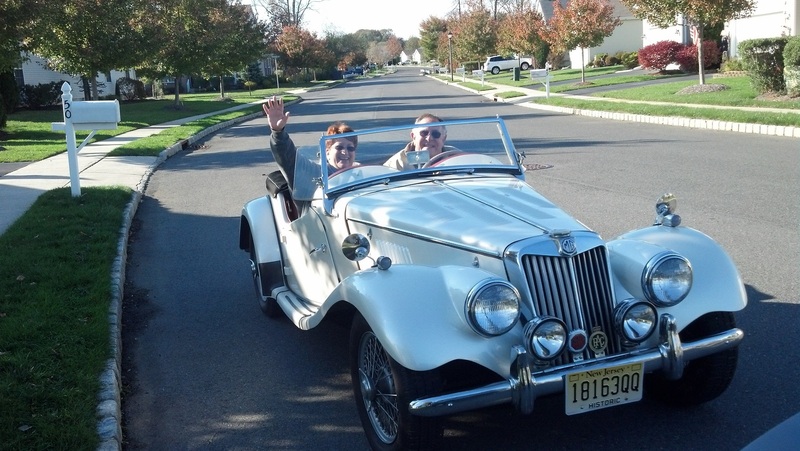 He located for sale a Pearl White 1954 MG TF that was only an hour or so distant from his home. He, and his wife Yvette, made the trip to view the roadster. “It was love at first sight,” Ruck remembers, “for both of us.” A sales agreement was made and Ruck’s wife informed him that he could consider the car as his retirement gift. The 12-foot, 3-inch-long MG was resting on 5.50×15-inch tires, which were wrapped abound silver gray wire wheels. The nimble MG rides on a 94-inch wheelbase and can be turned in a 31-foot, 3-inch circle. Access to the car is made through the doors with hinges on the rear. Four rows of louvers in the top of the engine hood that opens from either side, help keep the temperature of the four-cylinder 1,250 cubic centimeter engine under control. Ruck says the engine develops 67 horsepower as it sips fuel from the 14.4-gallon gasoline tank to feed the twin S.U. carburetors. The cooling system has a capacity of 12.5 pints. Tucked away beneath the engine hood is the 12-volt battery on a bracket on the firewall. Ruck did add an inline fuel filter and plans eventually to clean any accumulated residue from the gasoline tank. In a nod toward safety Ruck has installed seat belts that blend nicely with the red leather upholstery. Crowning the instrument panel is a centrally positioned horn button. The turn signal indicator switch activates the designated tail light and the light atop the proper front fender near the rear view mirrors. Gauges on the instrument panel include a 6,000-rpm tachometer, ammeter, oil pressure and odometer, as well as an optimistic speedometer. The speedometer can register speeds up to 100 mph,” Ruck says. He is quick to add that his MG won’t do that. With the top in the raised position the height of the MG is 4-feet, 4.5-inches. In addition to the top, the roadster has a black tonneau cover as well as side curtains with plastic windows. However, Ruck admits, it takes two men and a boy to secure the top and side curtains. If the sky looks as if rain is threatening Ruck advises that its best to find a bridge to park under. Ruck says that a previous owner of the 1954 MG TF replaced the four-speed manual transmission with a five-speed version, which enables the car to easily keep up with modern day traffic without straining the engine. Because Ruck is no stranger to MG TF models he is aware of what is required of him. The cars were initially designed, he says, for regular maintenance on a weekly schedule, which means that part of responsible ownership is the joy of caring for your ride. Would you like your car to be considered for an upcoming article? This entry was posted in Classic Cars of 1950s, Let's Restore this Old Car -- Classic Classics. Bookmark the permalink.